Have fun discovering what your pet enjoys as you bake through these 4 cat treat recipes. Some weeks ago, we published a piece about combining your passions for food and dogs through making DIY dog treats in your very own kitchen. But let’s not forget that a sizable portion of U.S. households (about 33%) are cat lovers/owners, some of whom would also like bonding with their feline pets through the joy of cooking! What’s more, you’ll know exactly what goes into your cat’s food, ensuring a safe and healthy snack time for your pet. Cats’ appetites may be more finicky than dogs’, so if your cat doesn’t take to your first batch of homemade treats, don’t be discouraged. 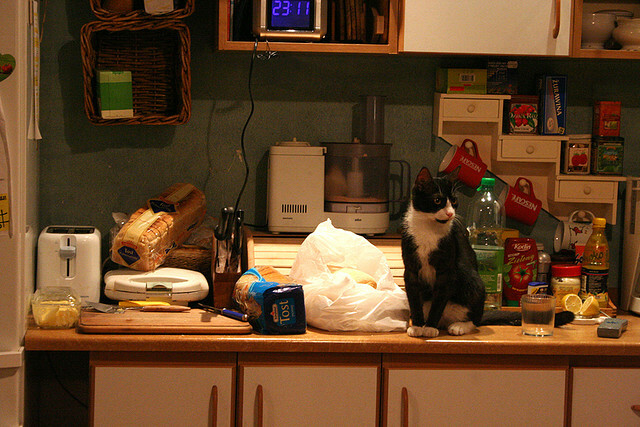 Try a new recipe with different ingredients to discover your cat’s gastronomical proclivities. But above all, enjoy yourself as you bake through these 4 DIY cat treat recipes. Of the 4 recipes given below, 3 contain dairy products. Know that some cats are not able to process milk and other dairy products such as cheese and butter because they lack the enzyme lactase to break down lactose found in these products. Eggs do not contain lactose and are therefore not considered to be a dairy product for the purposes of these recipes. The recipes below also contain flour, and cats can eat flour. But they should never be fed any dough that contains yeast, the byproducts of which can cause bloating and alcohol poisoning. In other words, don’t add yeast to any treat you are making for your cat. Before adding anything new to your pet’s diet, always check with your veterinarian first to keep your pet safe and healthy. This is an adorable online post from Joy the Baker in which she celebrates 2 years with her cat, Kitten, by creating some chewy snacks. 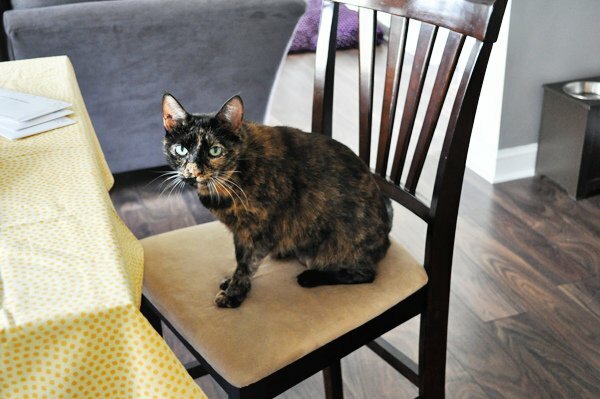 Though she’s known more in the blogosphere for developing delicious baked goodies for humans, Joy gives the same attention to detail in this recipe for her best feline friend. In a medium bowl, whisk together egg, baby food (or wet cat food), parsley, olive oil and water. Add brown rice flour and cooked rice. Stir to incorporate. The mixture will be thick but spreadable. Spread mixture onto prepared baking sheet, creating a rectangle that is about 1/3 of an inch thick. Bake for 12 to 15 minutes. Remove from the oven. Let rest until cool enough to handle, then slice soft dough into bite-sized pieces. Return pieces to the oven to bake for another 8 minutes. Remove from the oven. Allow to cool completely. Store in an airtight container in the fridge. Makes about 50 small treats. I have a special place in my heart for chicken liver paté. Even when I was young, and my grandmother would serve it up at her holiday parties, I couldn’t get enough of it. This recipe produces quite different results than my grandmother’s velvety mousse, but your cat may end up enjoying her first taste of chicken liver as much as I did. Note: I switched out the margarine for butter in the recipe, but feel free to make any adjustments as you see fit. Preheat the oven to 325 degrees F. Place well-done livers in a blender with 1/4 cup of water. In a bowl, combine flour and butter. Add liver mixture and carrots and knead dough into a ball. Roll dough to 1/4-inch thick and cut into 1-inch-sized pieces. Place cookies on a greased cookie sheet and bake for 10 minutes. Makes 12 cookies. Another popular online recipe comes from Amy at amybites.com. She adapted a great, slightly sweet catnip-filled treat for her handsome cat Ripley that you can share with your pet. She also includes fantastic photos of her baking process so you can follow along every step of the way. Preheat oven to 350 degrees F. Combine dry ingredients in mixing bowls. Add wet ingredients and mix to form dough. Roll out, adding more flour if needed, and cut into squares or small shapes. Bake for approximately 20 minutes. Cool completely. Store in airtight container or freeze and thaw as needed. If your cat has a sophisticated palate, perhaps he would be interested in looking at the cheese plate, hm? Okay, so this isn’t really a highfalutin amuse-bouche, but it is filled with cheddar and parmesan cheeses, which make everything yummier. While your oven is preheating to 350 degrees F, combine all the ingredients into dough (add a touch of water if needed). Knead the dough into a ball and then roll it out to a 1/4-inch thickness. Cut into one-inch pieces and bake for 25 minutes on a greased cookie sheet. Cool on a rack and serve. Makes about two dozen. Whether your cat has delicate tastes or will eat anything within paw’s reach, you’re sure to find something he loves to snack on that you’ve made with your own hands. Before commencing the baking process, be sure to review the list of things pets shouldn’t consume and avoid those foods.